Packer Ticket Raffle a HUGE Success - Winners Announced! 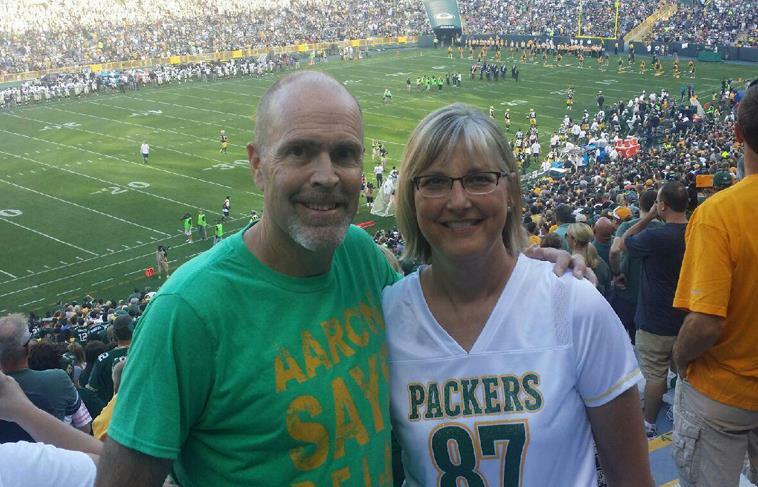 One of the winners in our 2015 GREEN BAY PACKER TICKET RAFFLE, Greg Thomas and his wife attended the Packers vs. Saints game at Lambeau Field on August 29. Fundraiser Chairperson Gary Zwirlein, reported that we not only exceeded our goal of $8,000 but went beyond expectations and raised a total of $9,035. For more on the fundraiser and a complete list of WINNERS read-on. After costs, our total was $6,655. Gary and others did a tremendous job with this first year effort. especially over the last two weeks with appearances at the Brookfield Farmers’ Market featuring former Packer, Bob Long. Thanks to everyone who took part in buying or selling raffle tickets or promoting the event. It turned out to be a rousing success! At our club meeting on August 14, President Mark Zalewski drew the winning tickets then pulled a game ticket out of a separate bag until all 10 games had been pulled. Surprisingly, we had 2 club members win tickets in John Allen and Mike Schmeling! The following is the list of winners who won 2 tickets to an upcoming Green Bay Packer home game during the 2015 season. CONGRATULATIONS to all the winners and thanks for supporting Elmbrook Rotary and the causes we support in our community and around the world. GO PACK!